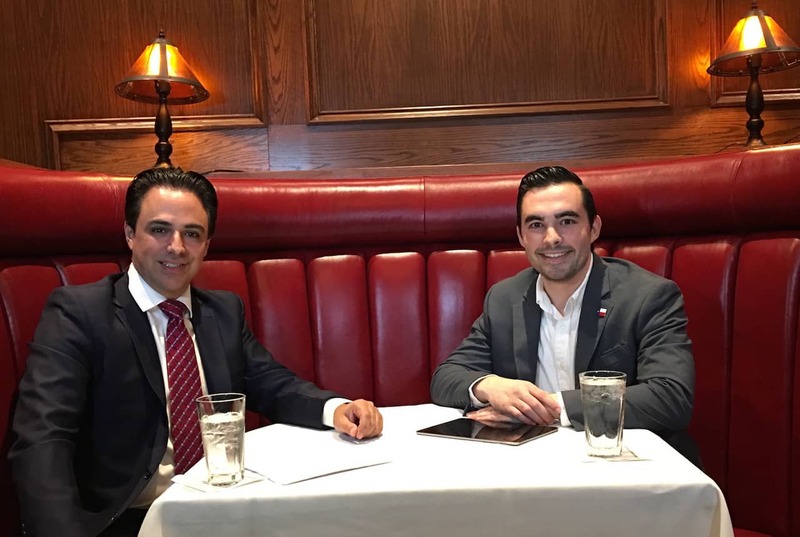 Featured: Rep. Terry Canales, D-Edinburg, left, is interviewed by Mark Hanna, Publisher, Rio Grande Guardian, on Thursday, January 25, 2018, at Bob’s Steak and Chop House in Edinburg. The two men discussed numerous major issues relating to the Texas Legislature, South Texas, and Hidalgo County. That conversation, which was broadcast live and is available on the Rio Grande Guardian, which is South Texas’ first online newspaper, is available at no cost by logging on to: https://www.facebook.com/rgguardian/videos/1800590286640933/?sid=0.46409932360984385 . National Federation of Independent Business (NFIB)/Texas, the state’s leading small business association, has announced that Rep. Terry Canales, D-Edinburg, is the only state legislator from Hidalgo County – and only one of three Democrats in the Texas Legislature – who earned a perfect 100 percent rating on key measures of vital importance to small businesses in the state. According to its website, NFIB, with 22,000 members in Texas and 325,000 members nationwide, is the leading advocate for small business owners, with offices in Washington, D.C., and every state capital. He may be reached at his House District Office in Edinburg at (956) 383-0860 or at the Capitol at (512) 463-0426. House District 40 includes portions or all of Edinburg, Elsa, Faysville, La Blanca, Linn, Lópezville, McAllen, Pharr and Weslaco. NFIB’s mission is to defend the right of small business owners, from every industry and sector, to run their businesses without undue government interference and to advance public policies that promote their success. NFIB is only major business organization whose policies and positions are established by the members directly, not by executive staff or the Board of Directors. NFIB ratings were based on five major bills approved by the Texas Legislature in 2017 that have an impact on small business. Lawmakers’ votes on laws with significance to independent business are not just happenstance, according to a news release issued by NFIB on Friday, January 19, 2018. Before each session, all 22,000 small business owning members of NFIB/Texas are balloted on issues affecting their business, their employees, and ultimately the state’s economy. The ballot results help formulate the NFIB/Texas legislative agenda, which is circulated and discussed with each member of the House and Senate. Twenty members of the Texas Senate and 84 members of the Texas House voted 100 percent in line with small business during the regular session. While not all legislators made a perfect score, a majority scored an 80 percent or higher. This legislation, known as “One for One”, created a rule that requires a state agency to repeal at least one state agency rule before it adopts a newly proposed rule. This will allow state agencies to devote more resources to compliance assistance, rather than adding more cost onto a small business by implementing more rules and regulations. A “Yes” vote supports the NFIB position. The Governor signed this legislation into law. “Whatever we can do to require the state to make it easier for businesses to operate in Texas, but without doing away with any laws or rules that protect the health and safety of Texans, I will support,” Canales said. This legislation enacted the P-TECH (Pathways in Technology Early College High School) education model in grades 9-14 and creates partnerships between public education, higher education, and business and industry. It was developed as a tool to create a direct pathway for students from high school to college to the workplace. The model builds upon a partnership between school districts/charters, higher education institutions, and business/industry, with P-TECH students receiving focused education and skills that will prepare them for high-demand, high-skill jobs. Small business owners with positions to fill have a perennial issue finding skilled workers. A “Yes” vote supports the NFIB position. The Governor signed this legislation into law. “According to the House Research Organization, ‘through partnerships between high schools, community colleges, and industry, the bill enables students to obtain both a high school diploma and associate’s degree or certification in six years. This would save students and their families college tuition costs. Students also would receive workforce training that could lead to a good job in an in-demand manufacturing or technical field. This would help meet the growing need in Texas for educated, trained, and career-ready graduates,’” Canales further explained. This legislation addressed so-called “drive-by” lawsuits against small businesses, including restaurants, convenience stores, hotels, and neighborhood banks, for alleged violations of the Americans With Disabilities Act (ADA). Under this legal business model, attorneys send demand letters to Texas businesses threatening to sue them under the ADA if they don’t pay a specified “settlement” amount. This bill requires that a complainant send a business a notification of its intent to sue under the state Americans with Disabilities Act, stating the specified alleged violation. It then gives the business owner 60 days to cure the alleged violation before the complainant may commence the lawsuit. The legislation prohibits attorneys from demanding settlement amounts in the initial alleged violation letter. A “Yes” vote supports the NFIB position. The Governor signed this legislation into law. ]This legislation prohibits cities and counties from imposing “California-style” fees on all new residential and commercial construction. These harmful fees are de-facto property taxes that would raise costs to Texas consumers causing harm to our state’s economic status and growth. Taxes represent four of the top 10 biggest problems for small businesses in Texas. A “Yes” vote supports the NFIB position. The Governor signed this legislation into law. Workers’ compensation fraud occurs when a person knowingly or intentionally conspires to commit, misrepresents, or makes a false statement to either deny or obtain workers’ compensation benefits, or profits from the deceit. Workers’ comp fraud is one of the main factors in the rising cost of workers’ compensation insurance. To focus more attention on identifying, investigating, and prosecuting premium and provider workers’ compensation fraud, the Texas Department of Insurance, Division of Workers’ Compensation (DWC), established a dedicated DWC fraud unit in 2016. This allows experienced DWC staff to better monitor and investigate fraud specific to the workers’ compensation system. Along with this centralization of workers’ compensation fraud investigations, current statutes authorizing the investigation of fraud were re-evaluated, and it was determined that it is necessary to clarify existing authority to ensure that criminal workers’ compensation fraud investigations are conducted in an effective and transparent manner. A “Yes” vote supports the NFIB position. A “Yes” vote supports the NFIB position. The Governor signed this legislation into law. According to the House Research Analysis, HB 2053 increases the penalty for fraudulently obtaining or withholding workers’ compensation benefits or coverage valued at $2,500 or more into a state-jail felony (180 days to two years in a state jail and an optional fine of up to $10,000).